Harry Hole is the epitome of the modern day noir detective. He’s a Norwegian Philip Marlowe. His life revolves around his cases. His relationships can never last because he lives for his cases not for his relationships. The only lasting relationship he can ever have is with crime. In this first installment, we see Harry as a bright eyed, bushy tailed detective on his way to Australia to help the Australian police solve the murder of a young Norwegian girl. He’s almost naive at the outset of this case. He seems so young and innocent in comparison to where I found him in The Leopard. Harry is quickly taken under the wing of a seasoned Australian police detective, Andrew, who begins to show him the ropes of the Australian police force. 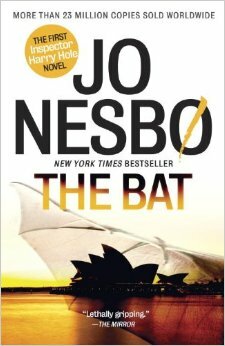 As with the last Harry Hole mystery I read, this novel is surrounded in folk tales and fables. Tall tales of creation stories that weave throughout the case Harry is working. In this case, Aboriginal creation stories are told, including the bat, representing death, Bubbur the snake, and Walla the fighter. Each folk character has it’s counterpart in a character involved in the crime. And it’s up to Harry to figure out who is who, what is truth and what is fiction. It doesn’t take long for the Harry in The Leopard to begin to emerge. The case soon drags Harry down the rabbit hole, kicking up his worst traits. It’s almost as if Harry has to succumb to the depths of his own depravity to see the depravity in others. Harry manages to get his man but each time at a greater cost. It makes me wonder what will be left of Harry Hole at the end of the series. Rating: 4/5 You can see Nesbo is still working out the kinks of Hole’s character in this one but I love the character study from the later novel to Hole’s creation.